The video for the remix of ‘Te Bote 2’ which features Casper Magico, Nio Garcia, Jennifer Lopez, Wisin, Yandel and Cosculluela, was released today, and I am saying “YES” to the dress…I mean trench. I know I’m not really ready to let her bubblegum GBV Couture dress go, but I feel like this total look would’ve had such a great impact on the red carpet for the premiere of her latest film, ‘Second Act’. 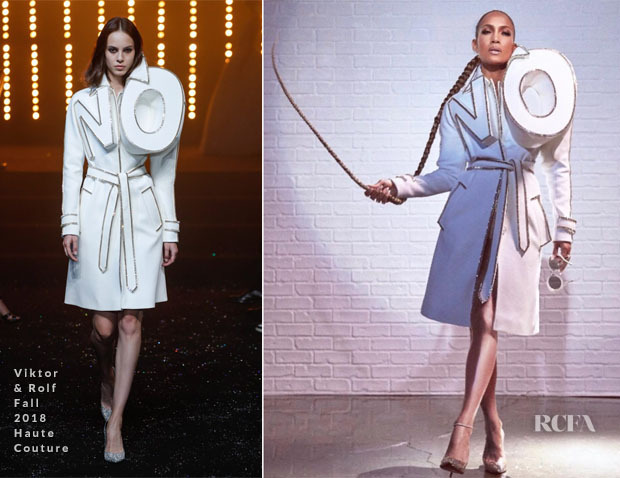 You may instantly recognise this Viktor & Rolf Haute Couture trench coat from the Fall 2008 collection, but this piece hails from the designers Fall 2018 collection which saw them celebrate their 25th anniversary by revisiting 25 of their most iconic designs in all white/ivory. Fashion is art collide beautifully here, with JLo adding more sparkle via her Christian Louboutin ‘Spikoo’ pumps and floor-length braid which is a trend started by Tessa Thompson.